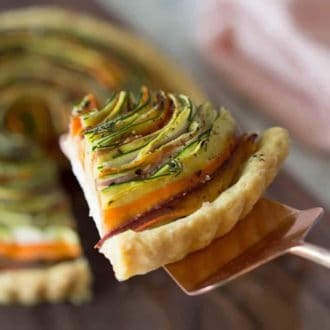 This delicious vegetable tart is filled with a layer of garlic and lemon infused goat cheese and topped with a mesmerizing spiral of thinly sliced vegetables. 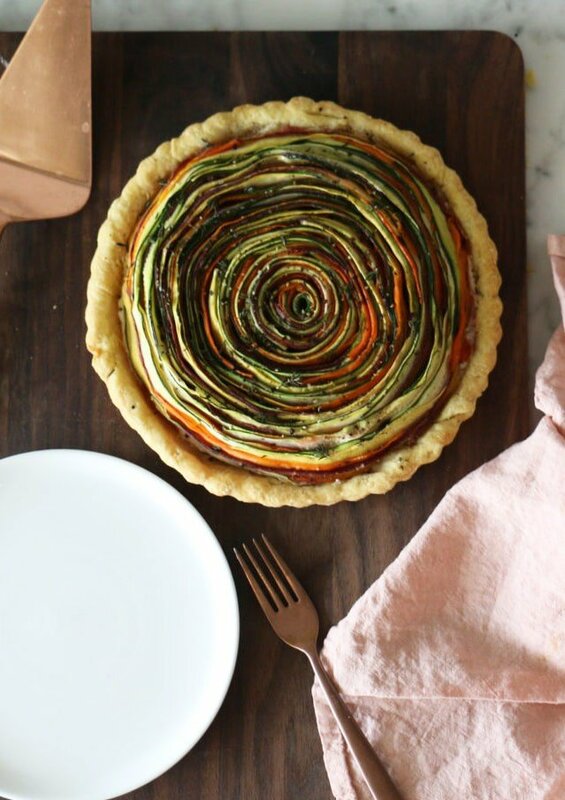 This vegetable tart might look a bit crazy but it’s actually a cinch to make! 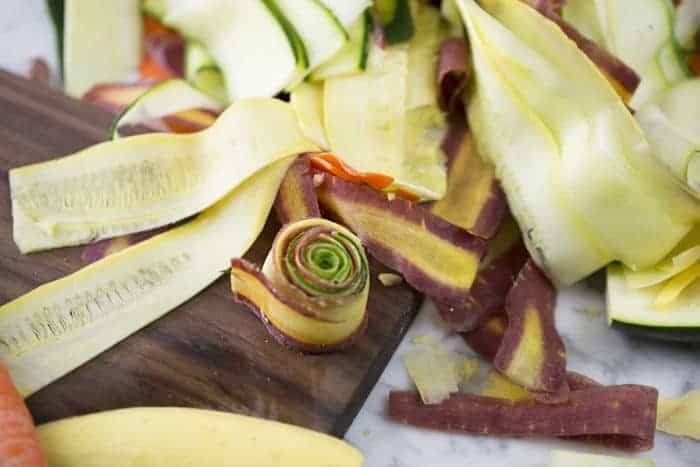 All you need is a trusty vegetable peeler to get thin sliced of heirloom carrots, zucchini, and yellow summer squash. The goat cheese filling is BEYOND! So easy to make but I know you’ll be subbing it into other recipes because it’s DELICIOUS! 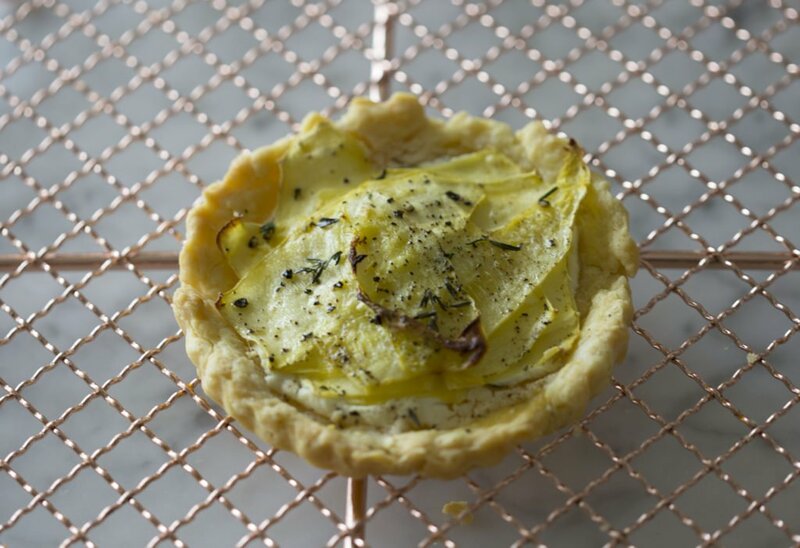 The tart might look crazy — and time-consuming, but really it’s pretty simple! A vegetable peeler makes all the thin slices. From there, you arrange them in a giant roll. A little radio or TV in the background can make the whole thing effortless. My favorite part of the tart is the filling. When you mix goat cheese, lemon juice, salt, thyme, and minced garlic you get something that tastes like “WOW!” You can spread it on toast, veggies or eat it by the spoonful as I did. Mix the minced garlic, lemon juice, thyme, salt, and pepper and set aside. 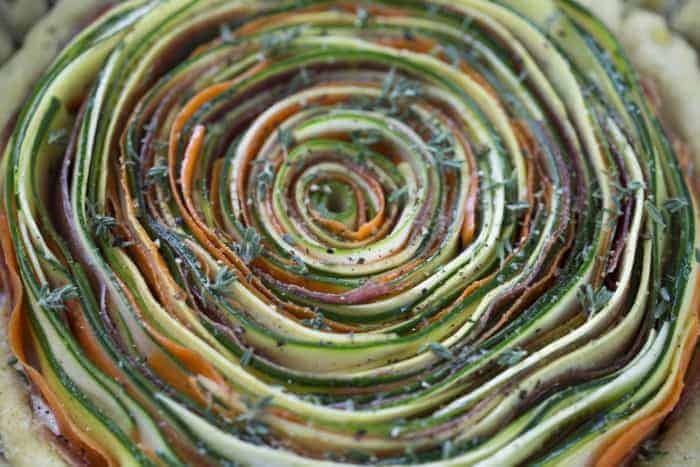 Just use a vegetable peeler to get those thin sliced for the spiral. It’s the easiest way and works quite well. It was hilarious making this pretty tart out of what looked like vegetable scraps destined for the compost pile Also…Have you EVER seen carrots that look so much like bacon?? 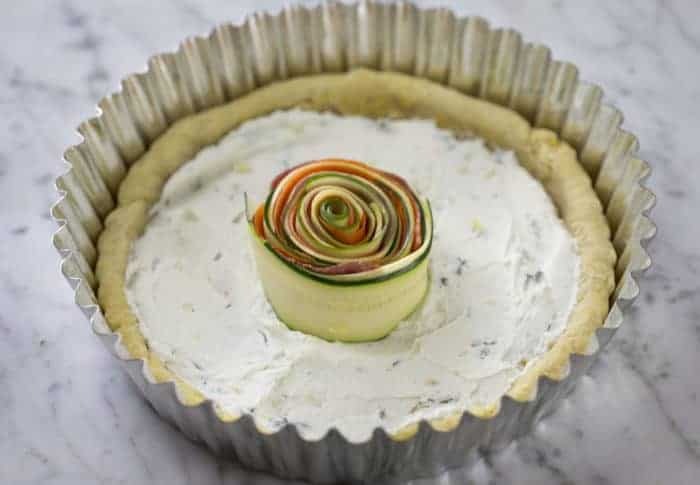 I found it was easiest to make the core of the spiral on the cutting board and then transfer it to the prepared tart where it can be easily added to. Once your tart is all filled out it’s ready for a good brushing of olive oil. The tart is ready for the oven after a healthy sprinkle of sea salt, pepper and thyme. Rosemary might be a nice addition as well. 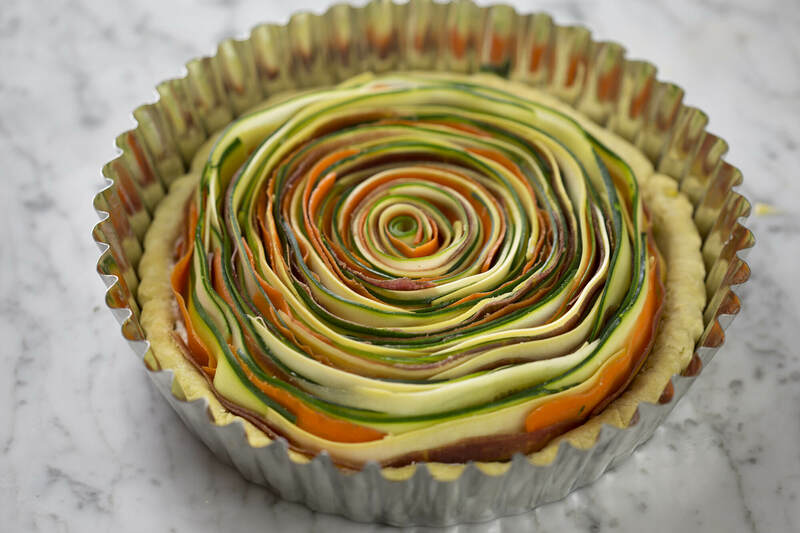 If you’ve tried this tart then don’t forget to rate the recipe and let me know how you got on in the comments below, I love hearing from you! 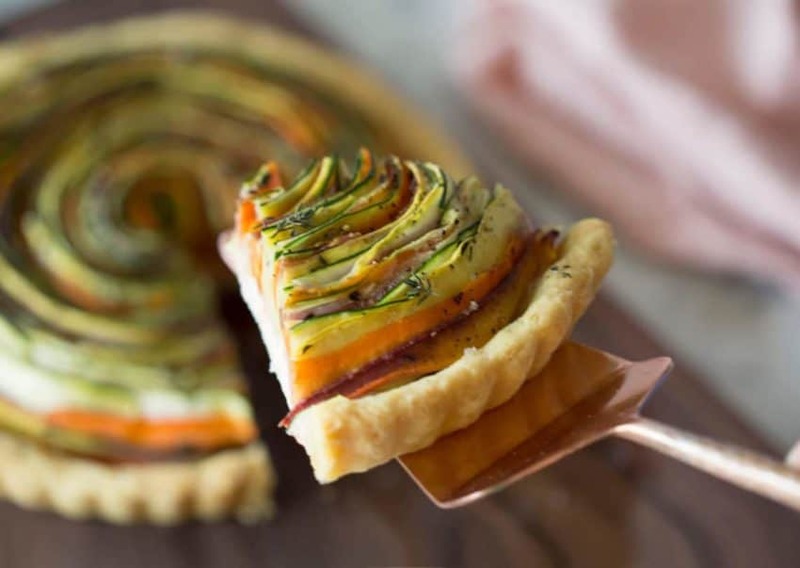 A mesmerizing vegetable tart with a flakey pastry base and a filling made from goat cheese, lemon juice, salt, thyme, and minced garlic. Mix the goat's cheese, lemon juice, garlic, salt and thyme in a small bowl. Mix the egg and lemon juice in a small bowl. Add the flour, butter and egg mixture to a food processor and pulse until if forms into a ball. 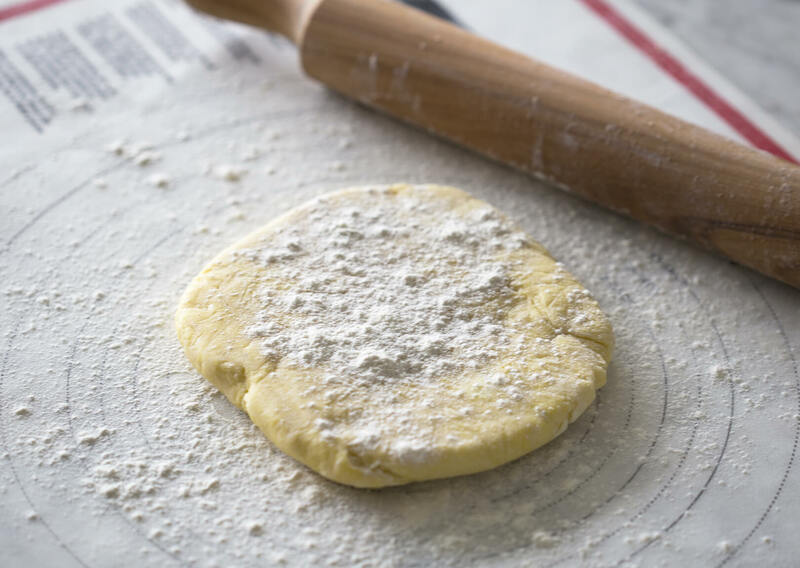 Place dough on a floured surface and knead about 5-7 times. Form into a disk, wrap in plastic and chill for at least 30 minutes. Roll out into a 10-11 inch circle and line tart pan making sure to puch into all the corners. Cover with parchment paper and weights (you can use beans or rice) and bake at 425F for about 18 minutes. Remove paper and wrights and brush with beaten egg yolk. Return to oven and bake for another 4-5 minutes longer. Allow to cool before applying filling. Slice the vegetables with a peeler and arrange on paper towels to absorb water. Spread the goat cheese mixture on the baked tart shell. Arrange the slices in a spiral. Brush tart with olive oil. Sprinkle salt and thyme (pepper is desired). Bake at 350F for about 50-55 minutes. Pate Brizeé recipe adapted from James Beard Foundation. If you want to make the crust without eggs, add 2 tbsp of whole milk and skip the egg wash. But WAIT! What if this seems like too much work??? This is the little tart I made from the scrap pastry and left over goat’s cheese mixture. I layered a few bits of summer squash on top and sprinkled with olive oil, salt, pepper and thyme. It baked faster and was a delicious treat! Looks so good! 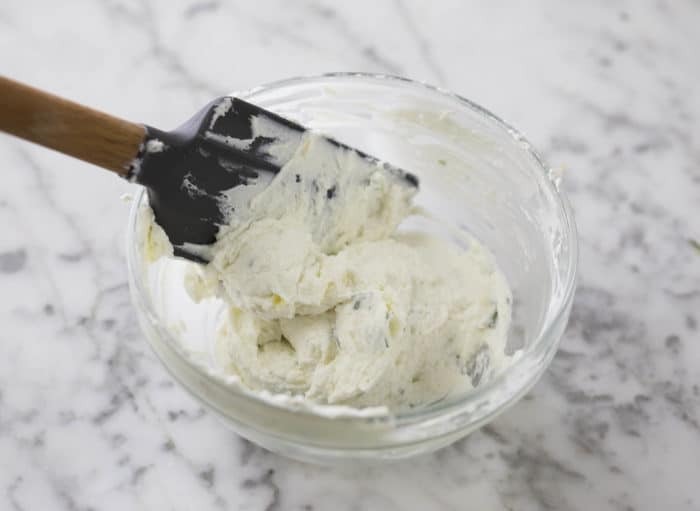 Could I use ricotta instead of goat cheese? Hi Emily — I personally wouldn’t. The ricotta is so mild that the flavor just won’t be there. Hope that helps, John. This looks so good! The presentation is phenomenal, I am definitely trying this tart! This beautiful. I saw the pgoto on your IG, and came here for the recipie. Your whole blog is lovely. I think I’d like to try it with good winter veggies… beets, carrots, turnips? I made this, and it was GORGEOUS, but I just did it for my husband and I.
I am going to make it again to show it off, but what would you recommend as a main dish and other sides to go with it? What did you dish with it? You could try my chicken breast recipe as a main dish or French onion soup as a side! How is this the next day? I’m thinking of serving as one side for large thanksgiving dinner party. It sure would help to make a day in advance. Yeah you can make it a day in advance! Just toss it into the oven the day of Thanksgiving! It’s fine to leave on the counter or in the fridge for the day, but I haven’t stored mine, so I don’t know! Hi John! I made this yesterday for the first time. Not near as beautifully as yours, but it was quite delicious! So glad you liked the recipe! This looks so beautiful. 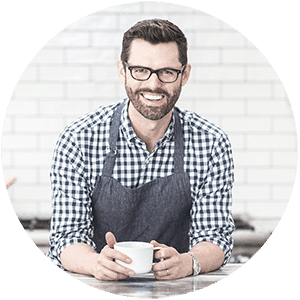 My husband has to have gluten free. I’m wondering if I could make a cauliflower crust instead? Ever experiment with GF? Thank you! I have only made cauliflower crust for pizza but i’m sure it could work. Let me know how it goes! For the crust, you can try! I have started the crust in blender by breaking up the flour with the egg and butter. Then I dumped it into a bowl to finish off by hand. Let me know if this works for you! I made this for a BBQ for Labor Day. I used 2 colors of carrots and green zucchini, as I’m not such a zucchini fan. It was a hit! Everyone was quite impressed, and pictures were taken by all! And it was delicious too!! I’ll definitely make it again.